GOMA, DR CONGO and WASHINGTON, DC – This Valentine’s Day, the Enough Project is launching a new campaign and video report documenting the trade in conflict gold from the Democratic Republic of Congo. Jewelry companies, the world’s largest consumers of gold, have an opportunity to help stop the deadly trade through supply chain action. Growing consumer demand for conflict-free products and the Dodd-Frank legislation on conflict minerals have helped reduce armed groups’ profits in the conflict minerals of tin, tungsten, and tantalum by approximately 65 percent. To fill this gap, some armed groups in eastern Congo have turned to the fourth conflict mineral—gold. The armed groups use poorly paid gold miners, nearly 40 percent of whom are children, working under harsh and dangerous conditions. 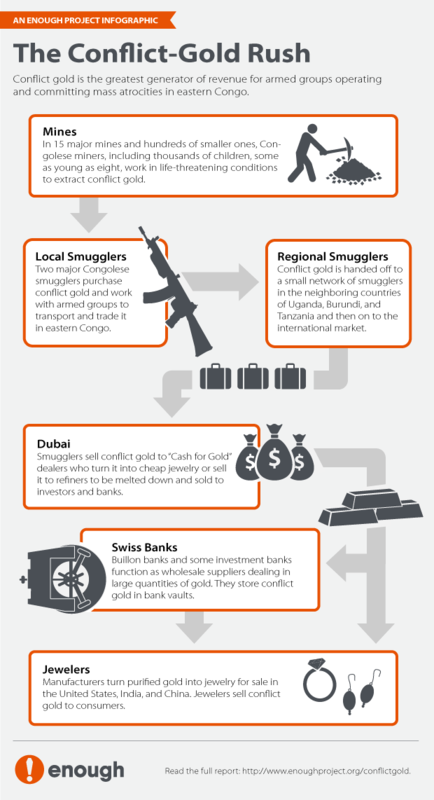 The Enough Project video, “Conflict Gold 101,” maps out the supply chain of conflict gold from eastern Congo mines controlled by armed groups to the gold bars and jewelry bought and sold at banks and retailers around the world. 6. Jewelers in the U.S., India, and China. The video stresses that consumer demand and investment from the jewelry industry is one part of a multi-faceted solution. Other key steps by governments should include sanctions on gold smugglers and aid to help formalize Congo’s gold trade.